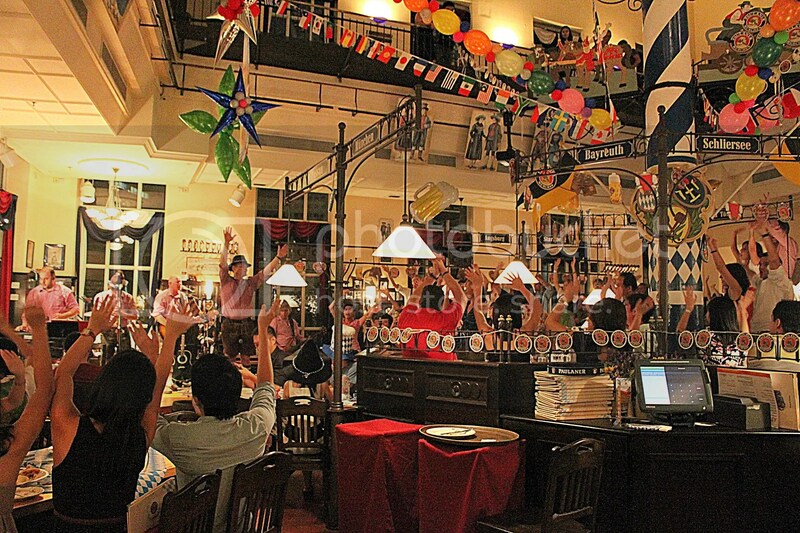 The concept of microbreweries was first conceived in Singapore in the early 1990s, by a small brewery called Orang Utan Brewery, located where Zouk now resides. The market just wasn’t matured enough then and it winded down shortly after. 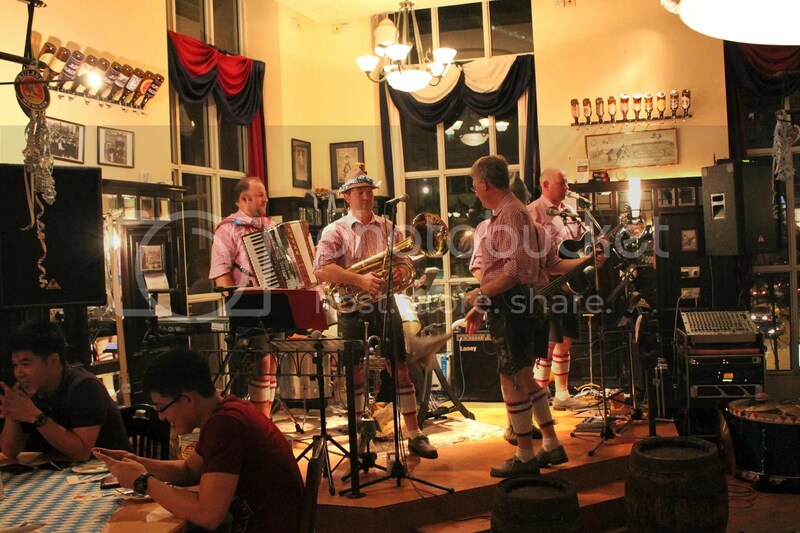 Next came Paulaner Brauhaus in 1996, currently Singapore’s longest standing microbrewery. Brewerkz was another early player which opened in 1997. Over the years, names such as Pump Room, Archipelago Brewery, Level33, Reddot Brewhouse and Tawandang have also jumped on the microbrewery bandwagon and added vibrancy to our domestic beer market. 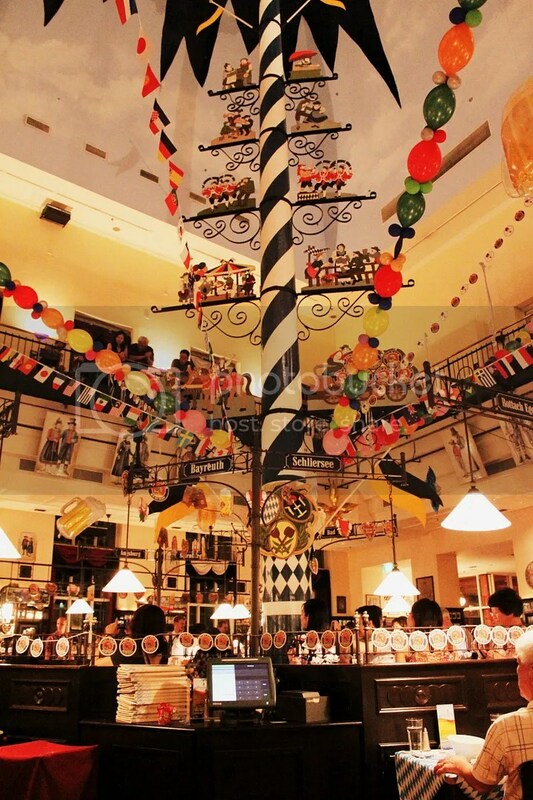 I first visited Paulaner slightly over 2 years back for a friend’s birthday. We had the Sunday Brunch Buffet, which is still ongoing and comes with either free flow soft drinks or free flow beer at $48++/$58++ respectively. 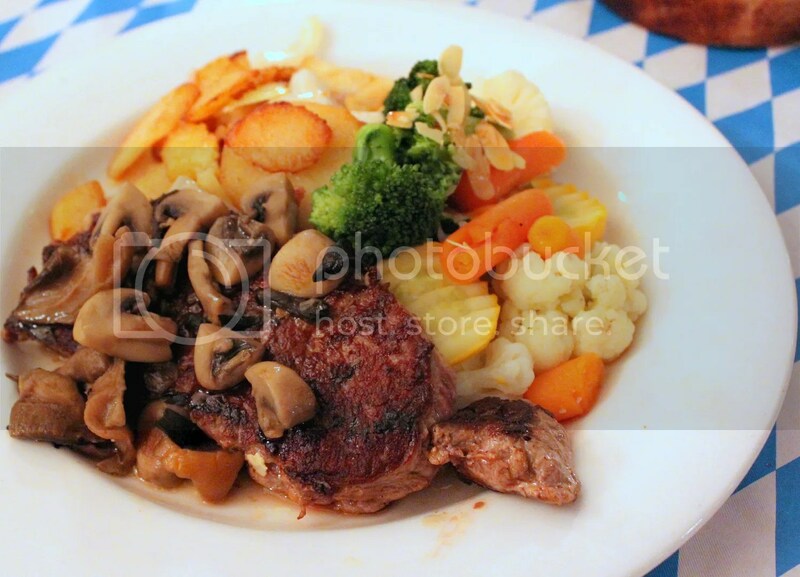 This time however, I was back for an Oktoberfest dinner event organized by the SMU Gourmet Club. In light of the Oktoberfest festivities, a German band was playing what I guess were German drinking songs and going around dancing with selected audience members. The party was still pretty mild at this time, especially since the night was young and few had had their fill of food and drink. 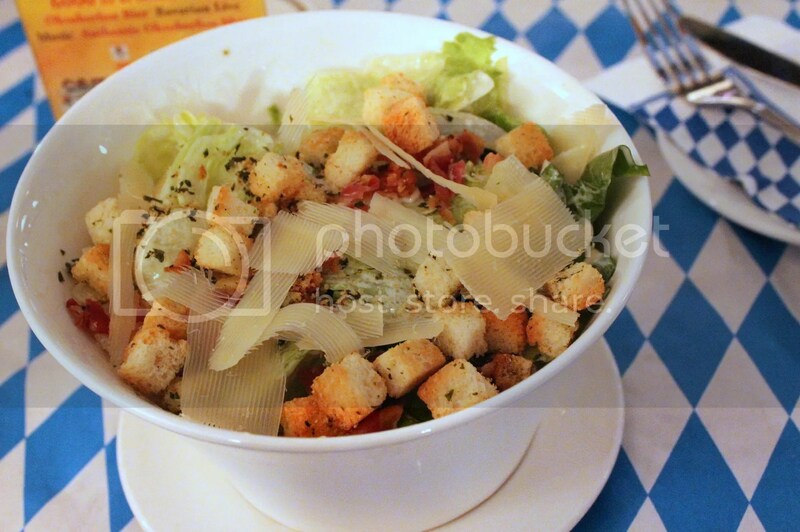 I started off the meal with the Caesar Salad with Air-dried Pancetta Ham and Garlic Croutons ($14++). I would say its not worth the money as there’s better alternatives on the menu. Come on, you are in a German Restaurant! Act like it and order some MEAT! 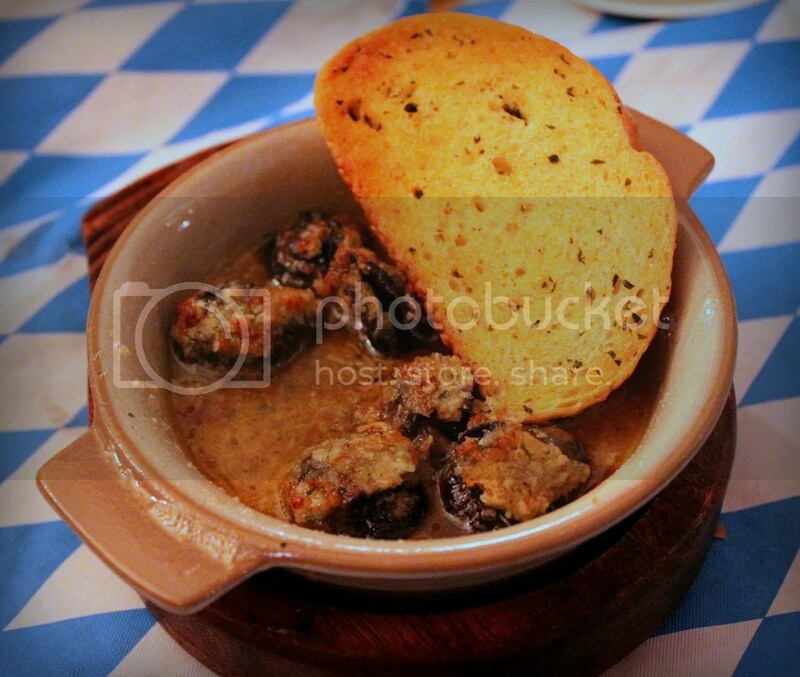 It’s weird that there’s Sauteed Escargots with Herb Garlic Butter ($16.50++) on the menu, since snails are more of a French dish. Still, it’s prepared rather legitimately here and the snails are plump and juicy, with a savoury garlic butter sauce that I didn’t hesitate to soak my garlic bread in. Someone took our preordered meatloaf by mistake, so being the magnanimous individuals we like to think we are, we swapped for their Munich’s Famous White Sausages with Freshly Baked Pretzel ($13.50++) instead. 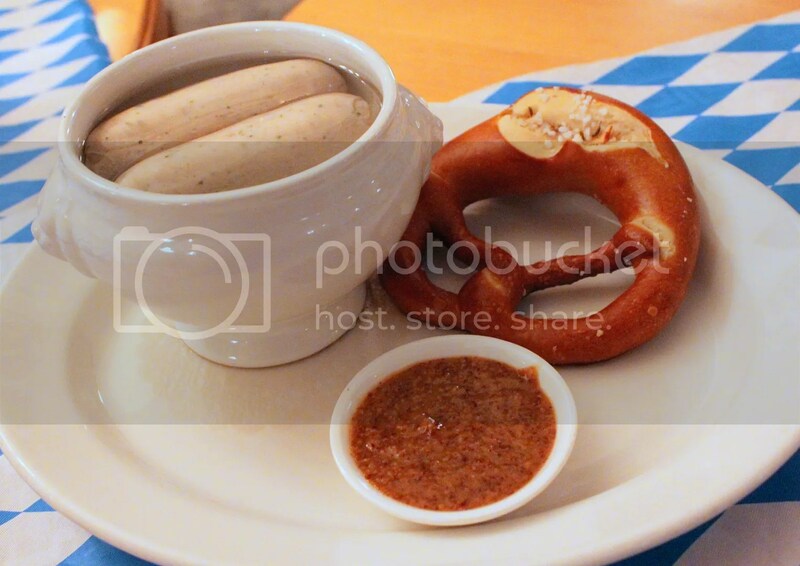 The pretzel is not worth mention but the sausages and dipping sauce are. The sausages are on the salty side but is toned down by the tangy mild BBQ-like sauce. 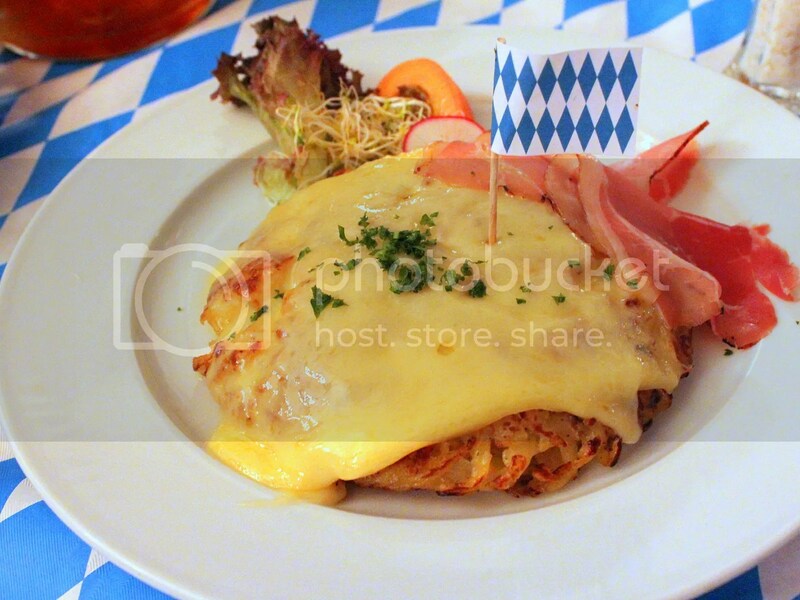 I’m still on the fence about the Potato Rosti with dry Smoked Ham Gratin with Gruyere Cheese ($13.50++). 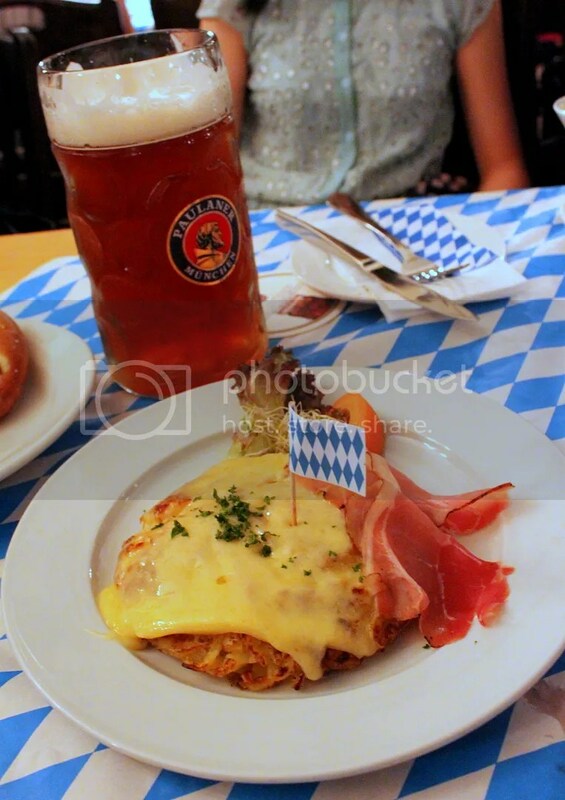 It’s nothing to shout about really, and the fried potato strips weren’t even crispy when the dish was served but there’s something about rosti that one finds it hard to complain about. You know that feeling too, it’s akin to complaining about hash browns and you just don’t! 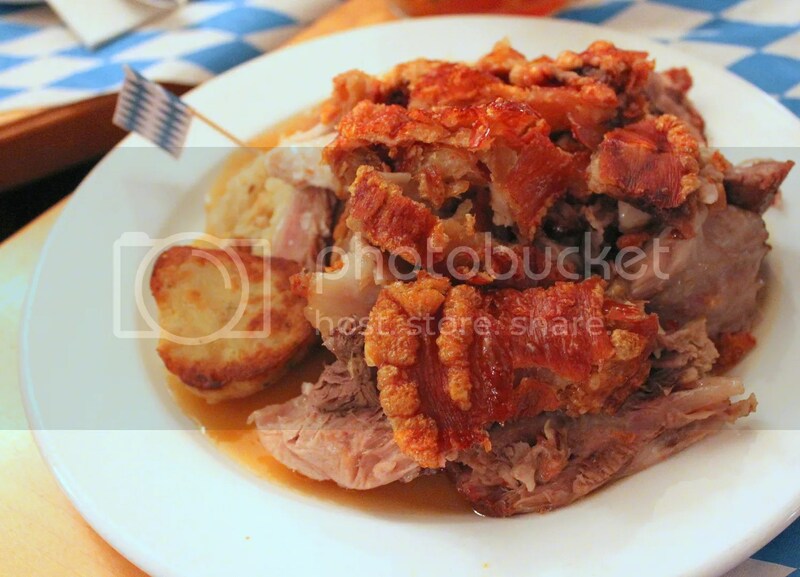 Never leave Paulaner without having their Paulaner’s Famous Grilled Pork Knuckle on Sauerkraut with Gravy and Bread Dumpling ($29.50++). It’s one of the better grilled pork knuckles I have tried so far and for some reason, it came conveniently deboned. 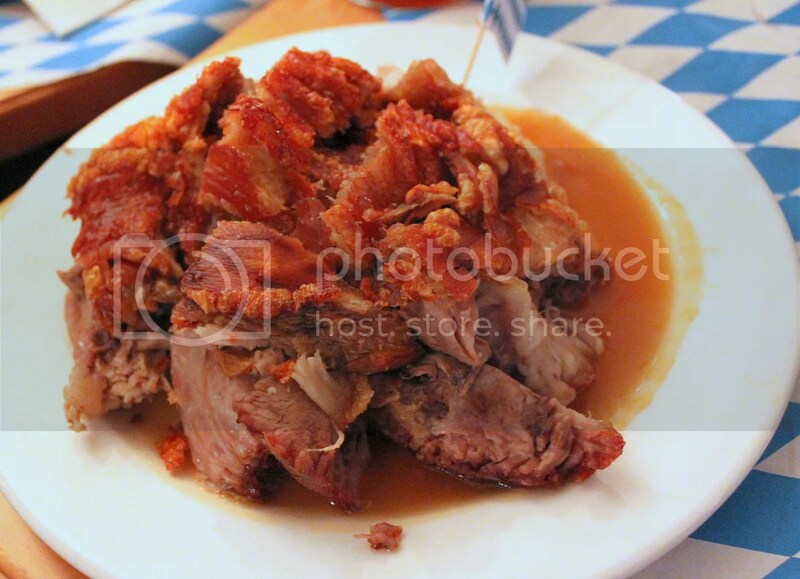 The meat is suitably moist with a nice layer of crackling and the portion was indeed generous enough for 2 to 3 people to share comfortably while allowing for stomach room for other dishes. The only thing I didn’t like in this dish was the Bread Dumpling, which tasted like a dry savoury muffin with random bits of vegetables inside. 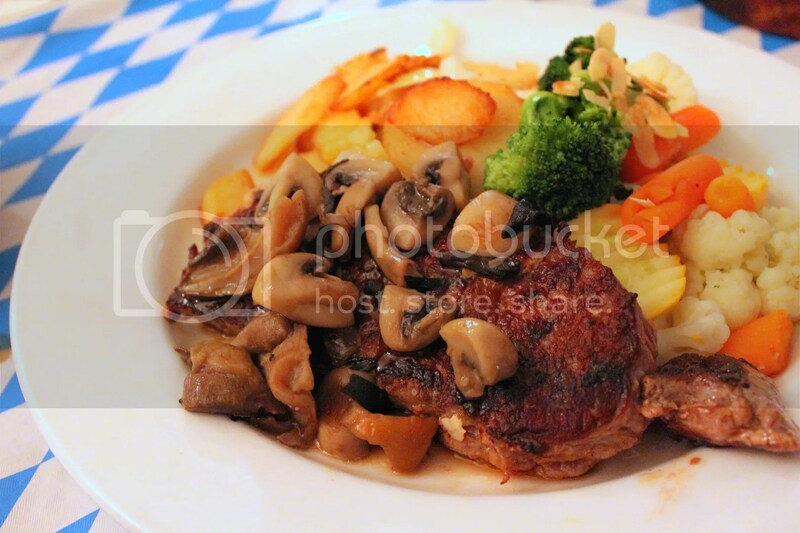 The biggest surprise today came from the Sirloin Steak 250g with Sauteed Mushrooms, Roasted Potatoes & Seasonal Vegetables. It was done as per request of medium rare, well marinated and tender. I had no qualms eating it without any condiments. The Roasted Potatoes are great too, lightly charred on the edges for that crisp texture and light smoky flavour. 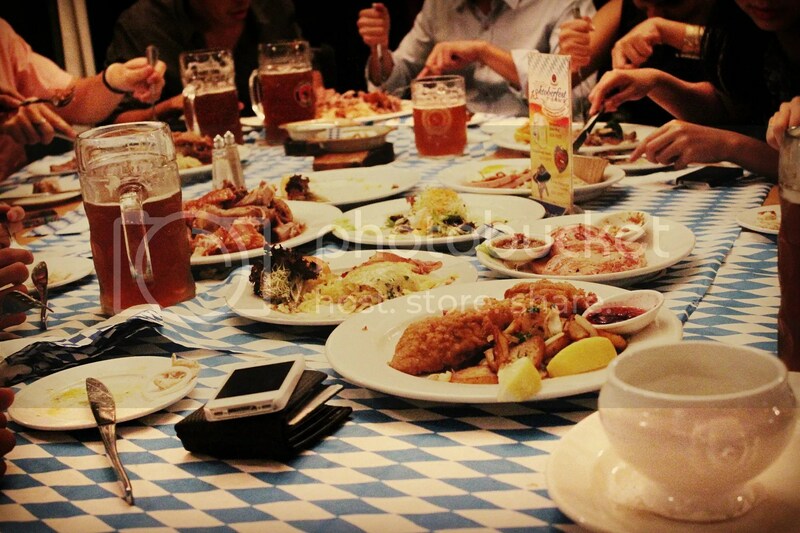 Paulaner offers 2 types of fresh brews on a regular basis, the Munich Lager and Munich Dark. Seasonal beers are offered at special times of the year so instead of the regular brews, only Oktoberfest Beer was available today. Beer girls were also going around with German Pear Schnapps. I tried a shot and it’s rather potent, the beer girl said it’s stronger than tequila but it definitely tastes better with a refreshing fruity aftertaste. 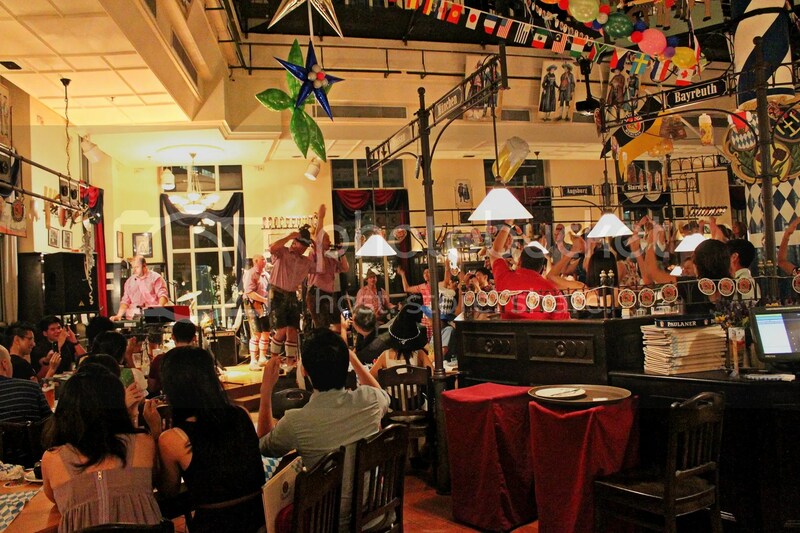 At the end of the meal, the band came out for a second set and fuelled with food, Oktoberfest Beer and Pear Schnapps, the crowd was really participative, standing on chairs while following the lead of the lead singer with his hand gestures, truly uncharacteristic of typical Singaporeans. I loved the spontaneity of it all and would return just to soak in the atmosphere again. PS: Don’t tell mommy you heard it from me but for the love of booze, I have 2 suggestions on how to get smashed whilst on a budget. While it’s not cool anymore to buy booze off the shelf, especially when there’s fresh beer from all the microbreweries around, canned beer is definitely the cheapest way to get smashed. Specifically, Baron’s Strong Brew. At 8.8% alcohol, it’s one of the stronger brews around and three 500ml cans will translate to roughly 11 shot of vodka, all for the price of $19.50 (assuming $6.50 per 500ml can). Categories : All YumYums in my TumTum, Bar, City Hall, Cuisine Type YumYums, Esplanade / Promenade, German, Location of YumYum, Yummy!